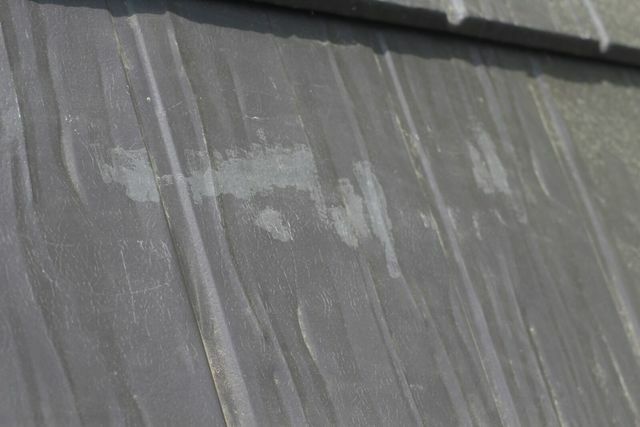 I was cleaning the leaves out of the gutters on my roof this past week and was reminded by the scratches on my roof that I hadn’t written a Homestars review on Clicklock yet. Ontarians may remember February 2015 and how bitterly cold the month was. It seemed like it would never end and +1 Celsius was always a week away. Unfortunately, this was the month that my roof was scheduled to be installed. The workers worked slowly away at it. I was grateful for their dedication and that my roof would be installed on schedule. I was glad to not be the one up on the roof during the weather. My previous asphalt roof had been losing shingles during high winds in November. I booked the installation with Clicklock at the end of 2014. 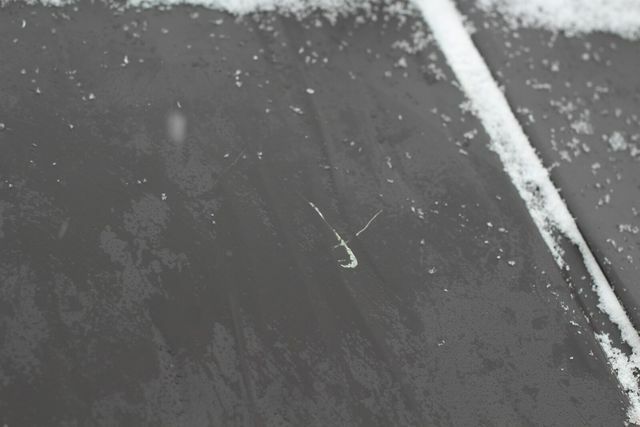 I’m not sure if it was due to the weather or other reasons, but there were quite a few scratches left on my roof. And, my wife made the final payment to the contractor before I was able to return home from work and look at the completed project. 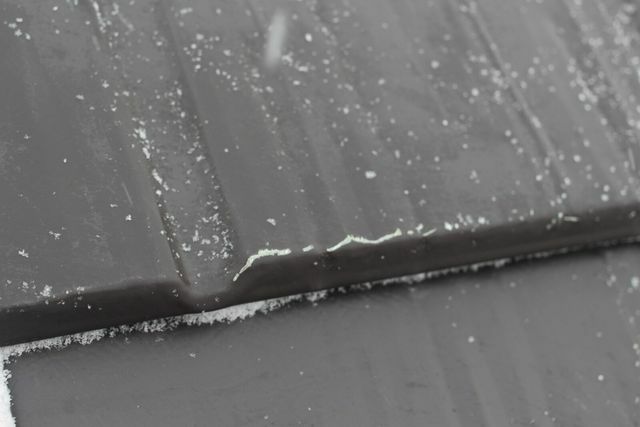 Most all of the lower portion of my roof had scratches, as you can see if you look closely at the photos attached to this review. Clicklock did return to patch up the scratches with paint when the weather was nicer. They used an acrylic, not the Kynar that was applied in the factory. This ended up looking a little patchy (photo also attached). There was no way that they could cover every scratch as they would have to repaint most of the roof. But, they covered the more major ones. Finally, an employee came and replaced about 10-15 pieces. There is still a dent and minor scratches across the rest of the lower roof. My biggest concern is over time if the damaged areas would peel or spread in some other way. These scratches are not noticeable from the ground, so I’m giving a passing grade. I’m appreciative of the effort that was made, but it is unfortunate to have after spending so much money on a small roof. Al did a thorough home inspection for us. He found the vermiculite insulation and guided us through the process of getting it tested. Luckily, it came back negative for asbestos. He didn't do a sewer camera inspection, and now we are having major issues with it. Though, I don't think it is common to do a sewer cam inspection for home purchases. Though, it should be! It would have saved me a few thousand dollars. Thanks very much Al! I would hire you again. PG Posthole came and installed 11 6x6 posts for my new fence. They drilled the holes, and set the posts for me. They supplied the lumber, even recommended a supplier to use for the rest of my fence. If you're looking to build a fence yourself, do yourself a favour and have some pros set the posts for you. It's totally worth it! CH Pluming came and installed a dishwasher in our new home. The contractor was very well mannered and did top-notch work. I would enjoy hiring this company again. Many thanks! After getting several quotes that all seemed out of our price range, we contacted Beverly Hills. They gave us a reasonable estimate and completed the work in a timely manner. We had two exterior doors replaced. The salesman helped us choose the right product. The installers were efficient and completed the work in a single day. Many thanks to Beverly Hills for helping us with this project. It was a pleasure to work with you.